Sandi Newsome after learning from Steve Andrews, she has won concert tickets and will meet Elton John. 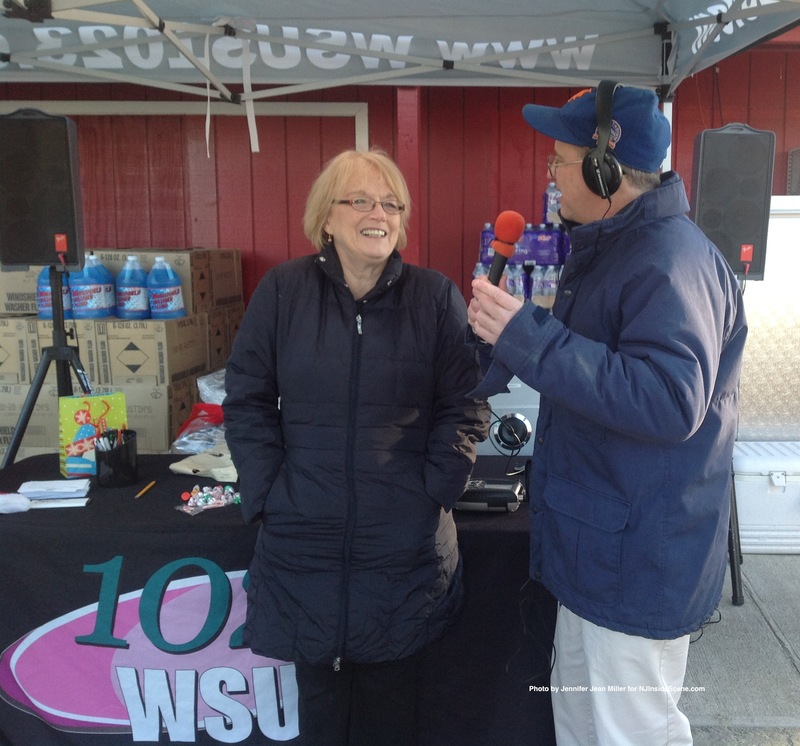 ANDOVER TOWNSHIP – Township resident Sandi Newsome was unaware yesterday, Monday, Nov. 25, when she was asked by WSUS 102.3 radio personality Steve Andrews, to retrieve her prize of $1,000 cash at Dale’s Market during the “Stuff the Bus” event, that there was something more behind her win. For Andrews, Newsome’s win was also a surprise. “I thought it was a prank at first,” he said, when his station received the call that Newsome was the winner of concert tickets to see Elton John in Las Vegas for his “Million Dollar Piano” show, where she will additionally meet the music legend, and take home his piano, as part of her prize. 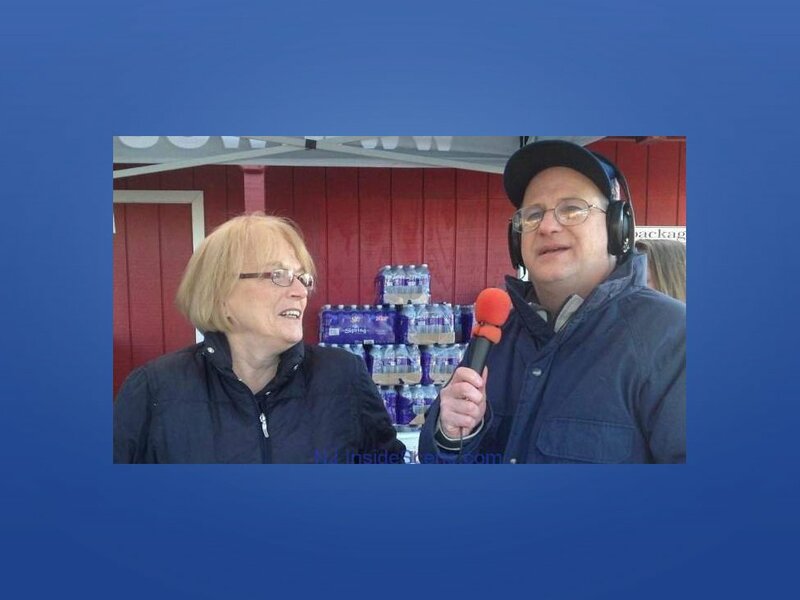 “WSUS is a station in this market, that is part of a national contest,” Andrews told NJInside Scene.com. NJInsideScene.com was on the scene, when Newsome received her news. Andrews asked her at first about the $1,000 prize that she would first be receiving, a preliminary part of the bigger contest. Newsome expressed she will split the winnings between her eight grandchildren. “’I’ll make room,’” Newsome replied. “You’re going to have to make room, Sandi,” Andrews told her. “Yeah, I’m going to have to make room,” she repeated. Newsome, Andrews said, will be flown to Las Vegas, have front row seats, will be taken backstage to meet Elton John, will receive signed sheet music for “Bennie and the Jets,” and then will be gifted Elton John’s piano to take home. Newsome, was full of emotion, greatly surprised and elated, and wiped away tears of joy, as she learned of the news. “There’s only one person in this contest to meet Elton John in the country, and she’s in Sussex County,” Andrews said. Click our video at the top of the story, to see Newsome learn of her exciting prize. Editor’s Note: NJInsideScene.com was thrilled too to be a part of this special moment, as Sandi Newsome learned she won the contest. Click here for our Facebook Page, for other stories where you will get the “inside scene” in Sussex County!